A Phone Call from Dalian.Edited by Nicky Harman. Trs. by Nicky Harman, Maghiel van Crevel, Yu Yan Chen, Naikan Tao, Tony Prince, and Michael Day. Brookline, MA: Zephyr Press/Hong Kong: Chinese University Press, 2012. 10 pp. Bilingual edition. Contemporary Chinese poetry—the phrase is almost paradoxical. While the binds between “Chinese” and “poetry” are tight enough, one argument suggests that if poetry is “Chinese,” it isn’t contemporary, and if it’s contemporary, it can’t be Chinese. One book titled How to Read Chinese Poetry stops its discussion before the twentieth century, implying that either contemporary Chinese poetry doesn’t exist, or else that it requires no special instruction on how to read it. But if “contemporary Chinese poetry” means anything, it should be that texts categorized within it should have something to say about “poetry,” the “contemporary,” and “China,” as well as any relationship between them. The instruction comes in figuring out how to situate the poem in terms of poetry as a whole, in terms of contemporary China, and in terms of contemporary Chinese poetry. 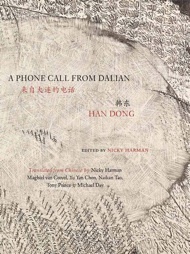 A Phone Call from Dalian 来自大连的电话, a recently published dual-language selection by Han Dong 韩东 (b. 1961), is a case in point. Han Dong’s poems are good; they are not difficult or obscure (let alone Obscure 朦胧), they are finely translated, and the selection is strong. Yet in the book’s two introductions are competing—or complementary—visions of how to approach not only the work, but contemporary Chinese poetry as a whole. Preceding the texts, they present alternate contexts: Nicky Harman writes that “Most of Han Dong’s poems are lyrical and stand alone” (xvii), whereas Maghiel van Crevel situates him “within the avant-garde” emergent in China in the 1980s, yet deviating “sharply from the grandiloquence and the daring metaphors of Obscure Poetry” (vii). Harman’s presentation will occur as the more successful vision for a collection of poetry in English, where readers will encounter the poems not only removed from their primary social context but also amidst a milieu that values disengaged yet self-contained lyrical expression. I will return to Harman’s acknowledgement of Han Dong’s “emotional directness,” “simplicity” and tender themes of “Bust-ups and bereavement” (xv), but suffice it to say that whereas she introduces Han Dong for readers ready to see a poet de-contextualized, van Crevel attempts to re-contextualize Han Dong for his English-language readers. The tension between the two introductions is the tension between Han Dong having something to say about contemporary China, on the one hand, and about a superordinary poetry (even if such a postulation is only what Stuart Hall has called a “dominant particular”), on the other. The situation of Han Dong within a social context is easy enough to assert, but harder to demonstrate in English, which involves an array of political considerations. I count eleven anthologies of contemporary Chinese poetry published in English around the world since 1990, for instance, but not one single-author collection published in English outside of Asia by a poet living in the PRC until 2008 (the single-author collections of Chinese poetry that were published in English were either poets dead by 1990, poets from Taiwan or Hong Kong, or exiles). [ 1 ] The overabundance of anthologies would seem like sufficient background within which to place Han Dong, but anthologies necessarily focus on breadth rather than depth, and as a result readers may come away with a sense of motifs common to the poetry as a whole, but not of how individual poets respond either to trends or concerns in poetry or to predicaments in society—which is where style finds definition. In other words, the anthology hides what makes an individual poet individual. In this context, Han Dong’s poem takes on a striking historical significance, not only offering, as van Crevel points out, “a forceful commentary on what was then the most influential modern poetry in China, after literature’s emancipation from total political control” (viii), but the demonstration that such poetry as Yang Lian’s was not as free from China’s political ideology as he may have hoped it to be. And yet, while Han Dong’s response is his most anthologized piece, what of Yang Lian’s? Van Crevel doesn’t quote it in his introduction, nor does he in the fuller version in Mind, Mayhem, and Money. Yang Lian did not include it in his 2008 retrospective, Riding Pisces (Shearsman, translated by Brian Holton), nor did he even reprint it in his collected poems, Where the Sea Stands Still 大海停止之處, published in Shanghai in 1998. I have taken both the English and Chinese of this poem from an issue of Renditions published in 1984. Han Dong’s most famous poem, the foundation of his style and voice, was based on something that has become a very obscure poem indeed! Yang Lian, evidently, is not proud enough of “Wild Goose Pagoda” to keep it in his published repertoire (perhaps he agrees with Han Dong’s implicit critique); I have the impression that Han Dong may no longer be very proud of his retort, either, and yet it has proven harder to distance himself from that early work (the poems in A Phone Call from Dalian are not arranged chronologically, which suggests a desire on Han Dong’s part not to build the collection on its foundation). This demonstrates a difficulty in reaching the social context or understanding literary history; every poet’s attitude toward that context becomes part of the history it constructs. I say none of this to disagree with van Crevel’s reading of Han Dong within literary history, but rather to note a frustration that emerges from my agreement with it: if we are limited in English from actualizing the importance of context to text in our understanding via translation, we are furthermore limited by being removed from the context even in the act of reading in Chinese. Whose hand it is doesn’t matter; the fact that it is a hand, capable both of making and breaking contact, defines the poem. The point is not how the poem engages with its context, but rather how context becomes irrelevant in the face of an emotion relatable to readers anywhere. While there are specifics that tie this poem to China—i.e. the monk, the “red-painted bucket,” the “pig-liver purple” face—there are also the moments that link the poem to a broader concept of poetry, via family connections all of us presumably have, even if a familiarity with poetry is necessary for the reader to appreciate how Han Dong denies and affirms what is meant by poetry as a broader concept. Yet what his anti-poems deny in poetry as a broader concept also return them to the Chinese particulars, whose expectations they can deny yet again, afresh. In part, the tension I note between van Crevel’s and Harman’s introduction is the tension of translation, which has to mediate between not only the text in its source and target versions, but also the contexts from which and into which that text travels (the “Gran” and “mum” in the poem above even note that tension within the different contexts of the broader context of English, as A Phone Call from Dalian collects versions by translators who are native speakers of English, Chinese, and Dutch, whose writing tunes in turn to North American, UK, and Australian Englishes). The tension is also completely appropriate to Han Dong’s poetry, based as it is in its social and literary-historical context, but emerging from that context to provide its tender, touching beauties. It also seems ever-present in contemporary Chinese poetry as a whole, which must mediate—translate—between local expectations and senses of reality, on the one hand, and the international standards, on the other, which have been informing those local expectations for over a century. The lines, like those in the book which precedes them, demonstrate both “the deconstruction of heroic themes, the repressionof conventional interpretation, the rejection of ‘literary’ language, and defamiliarization as a fundamental textual attitude” that Maghiel van Crevel links to Han Dong’s “quotidian themes, willed superficiality, colloquial language, and his individuality and sophistication” (xii-xiii), as well as what Nicky Harman calls his “startlingly intimate” (xvi) quality. But more than his being most contemporary, most Chinese, and most poetic in his poetry of “no more poetry” 不再诗歌, it may also be where he becomes most himself. [ 1 ] The anthologies, published in the US, the UK, or Australia, are Edward Morin, ed., The Red Azalea (1990); Donald Finkel, ed., A Splintered Mirror (1991); Tony Barnstone, ed., Out of the Howling Storm (1993); Michelle Yeh, ed., Anthology of Modern Chinese Poetry (1994); Wang Ping, ed., New Generation: Poems from China Today (1999); Naikan Tao and Tony Prince, eds., Eight Contemporary Chinese Poets (2006); Zhang Er and Chen Dongdong, eds., Another Kind of Nation (2007); Julia Lin, ed., Twentieth-Century Chinese Women’s Poetry(2009); Wang Qingping, ed., Push Open the Window (2011); Yang Lian, W N Herbert, and Brian Holton, eds., Jade Ladder (2012); and Ming Di, ed., New Cathay (2013). The only poet living in the PRC whose work I could find in English translation between 1990 and 2008 was Shu Ting 舒婷, who had two collections published by Renditions in Hong Kong and Panda Books in Beijing. In 2008, Bloodaxe published a collection by Yi Sha 伊沙 (translated by Tao Naikan and Simon Patton) and Ragged Banner Press published a collection by Woeser ཚེ་རིང་འོད་ཟེར་ 唯色(translated by A. E. Clark).